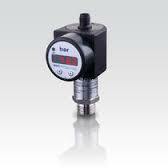 The electronic pressure switch DS 201 is the successful combination of an intelligent pressure switch, digital display and has been specially designed for universal usage in industry applications. The DS 201 is available with flush pressure ports for viscous, pasty and highly contaminated media. As standard the DS 201 offers a PNP contact and a rotable display module with 4-digit LED display. Optional versions like e.g. an intrinsically safe version, max. 4 contacts and an analogue output complete the profile.